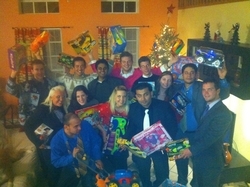 Florida-based marketing firm collects and donates toys to underprivileged children. Community service should not be looked at as simply doing something for someone, but assisting them in making life better and more fulfilling. The Vause Group, Inc., a Florida-based marketing firm, announced their support of the Baby DJ program offered through Central Florida’s XL106.7 FM radio station. The program is aimed at giving back to underprivileged kids of Central Florida during the holiday season. Team members from The Vause Group, Inc., along with President Joshua Vause, collected toys and gift cards for the children who are supported through the Baby DJ program. They were brought to a holiday company party and donated to the radio station program. In addition to the goods donated, the team at The Vause Group, Inc. raised funds to help the Baby DJ program provide selected families with money and gift cards for a Christmas dinner. The Vause Group thought that it was important to support a local organization during a time of giving. The Baby DJ program has been helping local Central Florida families and children during Christmas for the past ten years. Without contributions, like those of The Vause Group, the program would not be able to support as many families and children as it does. About The Vause Group, Inc. The Vause Group, Inc. is Orlando, Florida’s premiere and privately owned marketing firm. Because the traditional forms of advertising and marketing (direct mail, bill boards, telemarketing, and email advertising) are not nearly as effective as they used to be, The Vause Group was created to acquire and retain business customers in a personalized manner for many of the nation’s leading Fortune 500 Companies. For more information, please visit http://www.thevausegroup.com.